Time: Saturday at 8:00 a.m. – 3:00 p.m.
Understanding the basics of nighttime photography takes a different skill set than simply pressing the shutter when there is daylight to capture. This day-long presentation will be filled with stories of what goes into making the images from start to finish. 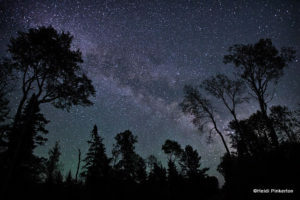 From basic understanding of space weather to what to make images of in the night sky, Heidi Pinkerton of Root River Photography will be sharing how she captures the magic of the night. A light lunch will be provided during this program. This is a hands-on workshop designed to help you learn the basics of your camera, and how to create the images you desire. Bring your camera, manual, tripod, cable release, batteries and CF/SD cards! We’ll have plenty of opportunities to practice on focusing techniques, along with a light lunch mid-day. Activity Level: Easy. All instruction will be on-site at the International Wolf Center. The minimum number of registrations is not met. (Full refunds will be given to those who have registered, however, the Center is not responsible for additional expenses incurred by participants in preparing for the program including flight and/or other travel expenses). Severe weather or other emergency conditions occur that may endanger participants or staff. All cancellations are subject to a $50.00 processing fee. Cancellations made between 15 and 30 days (or more) of the program start date will receive a full refund of program fees, or a credit to be used towards a future International Wolf Center program. Cancellations made within 14 days of the program start date will not receive a refund. No refund can be made for absence from the program unless arrangements are made at the time of the booking. The International Wolf Center regrets that it cannot make exceptions to the refund policy. If you think there is a chance that you will need to cancel, we recommend purchasing separate trip insurance.